The Bemco® Backpacker Oven holds U.S. Patent #8,261,731 B2 and D636,216 S.
NOTE: the oven is only to be used with stoves that do NOT have the fuel tank attached. All Bemco® backpacker ovens are made of light weight aluminum that is flexible and durable. These ovens are not meant to be air tight. They can be used with backpacking stoves and most camp stoves. You can also use them on your home or RV stove top. 7", 8" x1.5" x 12" tall. 9" folded oven is 9"x 1.5" x 13" tall. 7" oven weight 24.60 oz. 8" oven weight 29.55 oz. 9" oven weight 41.55 oz. These weights include the thermometer, straps, and baking guide. 9" kit wt: 56.60 oz; includes 9" oven, 8" shallow pan, 8" deep pan. 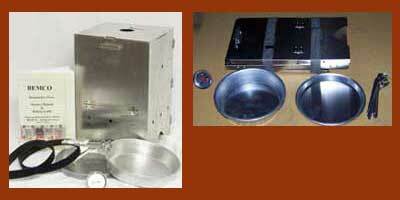 All kits include the basic oven, plus one each shallow baking pan, deep baking pan, pan gripper, and the baking guide. Time required to reach 500° F: 90 sec. Time required to cook two 6" Pizzas at 14,496 ft elevation: 15 min. Additional cooking pans, see Store Front. Shipping is by UPS (United Parcel Service) or United States Postal Service. Rush service is shipped U.S. Postal Service Priority Mail average 2 to 3 days. If you are not completely satisfied with your new Backpacker Oven simply return it to us within 30 days and we will refund the price of the oven.